Why do we repair/restore postage stamps and covers? How do we repair/restore postage stamps and covers? 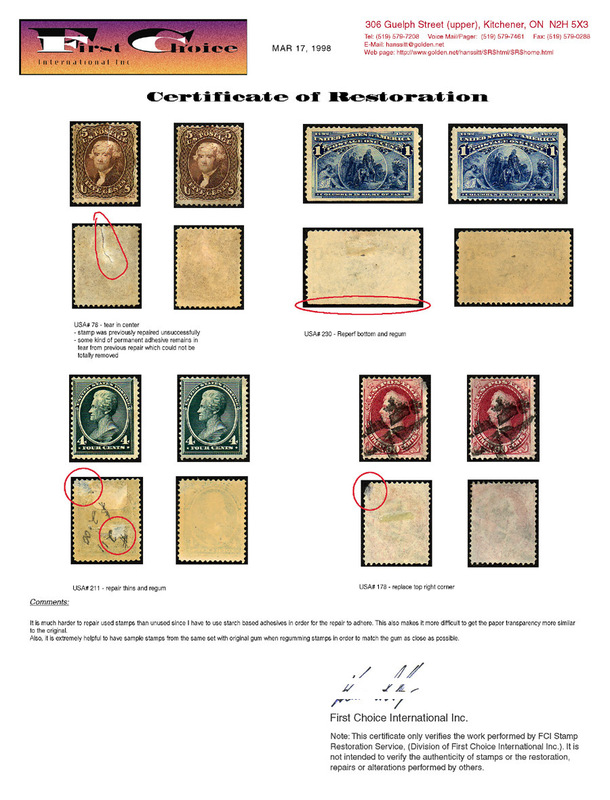 do we repair/restore postage stamps and covers" below. We firmly believe to have the most comprehensive and accurate tooling, - anywhere - and that, along with a pricing policy that will allow you to even get stamps of a lesser CV repaired and or restored. If you would like to have help with calculating any repair costs and you have access to Microsoft Excel, we can email you our Excel template. All you would need to do is fill in the information and it will calculate the estimated repair cost for you. We are a small Canadian company dedicated to the preservation of postage stamps, covers and other paper collectibles. We have been in business since 1985 and have developed a global customer base. The company was founded by Hans Sitt Sr. who in his time was an avid stamp collector. The company was originally known as L. Armstrong Stamp Restoration Service, named after his former daughter-in-law. He, as is the case with many collectors, could not always afford to stock his albums with premium quality stamps. Yet, he still liked to add copies of these somewhat more rare varieties, even if somewhat flawed. At that time it did not seem possible to find anyone to repair and restore these items at a reasonable cost. Over time, much research was done in order to learn how to restore and preserve articles of paper. Since then, our ever-growing experience has allowed us to supplement our techniques with new and improved methods and procedures. We can offer affordable quality restoration and repair work, which will help to ensure the integrity of your collection for years to come. We operate this business on a part time basis with Anne Marie now virtually exclusively performing the restoration work. Due to my full-time position as maintenance manager at a multi-national food processing company, I find I have limited time to work on items myself but will lend a hand if and when required. Therefore, it may take from several days to a few weeks for us to return an order. If work is time sensitive it will be best for you to email us so that we can estimate a completion time. We repair/restore postage stamps, covers and other paper collectibles in order to maintain them in the best possible condition for the enjoyment of philatelists and other collectors throughout the world. We offer a wide range of services. Much of our work relates to repairs of items with flawed or missing gum, repairing thins, torn papers, missing corners or perforations and reperforating. We also clean soiled stamps and covers and can remove or improve many types of stains. If necessary, we can rejoin separated perforations and repair creases, often by keeping the original gum in tact. The work is not exclusive to stamps and covers but also includes any collectible papers. As with any repair work, there are limitations to what can be done. Unfortunately for some items, it is not possible to achieve a marked improvement on their condition. Unless you give us specific instructions, which would allow us to perform whatever work we deem necessary, we would return such items as received. If in doubt, we are more than happy to have you mail us any items for evaluation and we will promptly get back to you with a quotation regarding the feasibility of repairs and associated costs. Please feel free to take a look at our Price/Services list for more detail. No matter where you are located, we would like to be able to add you to our growing list of satisfied customers. Some stamps in Canada and the United States for example are now over a century and a half old. Due to their age, being handled by people and often less than favourable storage conditions, many stamps have begun to show signs of deterioration. Really, there is little difference between repairing postage stamps, works of art or for that matter any other collectibles. If it were not for the fact that many of these items were properly cared for and from time to time repaired or restored as needed, many such items would now no longer be around for us to enjoy. Surely, it would be a great loss to all if collectibles were discarded only because they were damaged or of otherwise lesser quality. With every item, which meets this fate another piece of history is lost. If we want to keep our hobby and in many cases our investment alive, then it is necessary to stop or at least retard this aging process so that future generations may also enjoy these collectibles. We intend to restore and repair postage stamps, philatelic items and paper collectibles at reasonable prices employing the highest quality workmanship. We charge no more than 20% of the value based on recent Scott catalogs. (Due to their cost, we replace them only every few years and currently we use a set of 2011 catalogues). The basis for our charges are either the mint or used catalog (Scott) price of the stamp, as the case may be. For repair cost evaluation purposes we do not discount the catalog value due to a stamps physical condition. We charge this amount UP TO our Regular Price (i.e. for Regumming this would be $7.50 USD). For a complete schedule of pricing please consult our price lists which can be accessed directly from the bottom of this web site. For stamps valued above $100.00 USD we bill an additional 3% of the catalog list price. By doing this, we can afford to spend the additional time on an item in order to give it the attention it deserves. I suppose, one always could second-guess the work done and under large magnification come to the conclusion that something could have been done better. But, as with anything else, this comes down to a matter of economics. For example, it is not possible for us to spend 4 hours repairing a thin and regumming a $20.00 stamp for a price of $7.50. Hence our surcharge of 3% for stamps listed at over $100.00 USD. Conversely, it would still be economical for a collector to have a stamp repaired which is only valued at $5.00. The repair, regumming etc. would cost only $1.00 USD. Although our charges are cumulative, the total repair cost per item will never exceed 20% of the stamps, (mint or used), listed catalog value. To fill a thin (regular price $18.00 USD) and to regum ($7.50 USD) a stamp with a catalog list price of $10.00 USD would cost the lesser of 20% of the value or the Regular Repair Price. In this example the Regular Repair Price adds up to $25.50 USD. However, due to the stamps low catalogue value, the charge will only be 20% of $10.00 USD, which is $2.00 USD. The cost to fill a thin and to regum a stamp with a catalog list price of $600.00 USD would be the lesser of 20% of the catalog list price or the Regular Repair Price plus 3% of the of the catalog price of the stamp. In this case, the cost would be $18.00 + $7.50 + $18.00 (3% of $600.00) for a total of $43.50 USD. This works out to only a total cost of 7.25% of the value of the stamps catalog list price. For pricing of repairs to covers or other paper collectibles please email us a description of the item, it's estimated value and the repairs desired. If possible, please attach a jpg scan of the front and back of the item at 100 to 300 dpi. This will help us greatly in determining the cost of the repair. Depending on the work required, the minimum charge for repairs of this nature would probably start at $50US. When items are shipped to us, it is our policy to return these items the same way as received. If stamps arrive by First Class Mail we will return them by First Class Mail, if the shipment was registered, it is returned registered - unless specified otherwise by the customer. By sending us stamps by First Class Mail and us returning it the same way when no request is made by yourself to return the items via registered mail you understand and agree that we cannot be responsible for any stamps being lost in the mail. For this type of work, the quality of workmanship is at best highly subjective in nature. Often some flaws in stamps sent to us for restoration, due to previous repairs by others, become apparent only after the work has commenced. As we strongly believe in satisfying our customers, we fully warrant OUR work. At our discretion, we will either rework any stamp(s), which were not restored by us to your satisfaction or any money paid by you for such repairs/restorations will be unconditionally refunded. It is understood by both parties that any money refunded only applies to the repair cost charged by First Choice International Inc. (FCI Stamp Restoration Service). Although we take all reasonable care to protect any items entrusted us for restoration or repair, YOU, the owner or its authorized agent, is solely responsible for any loss or damage to your items while in our custody, however caused. We use similar techniques to repair rips and tears, thins in paper as would be applied by conservators treating any paper of value. Much care is taken to repair physical flaws to the paper or to replace gum, which might be damaged or missing completely. Most of this is very delicate and time consuming work and it is not uncommon to have to repeat procedures in order to affect the proper repair. Usually, other than taking additional time, this doesn't present us with problems as most of our processes are reversible. Just for example, as part of our tool inventory, we have a set of custom designed and manufactured perforation dies consisting of 44 dies of varying spacing and an accompanying set of 22 hole punches. The perforation dies are manufactured in varying sizes starting with dies for a perforation of '7' (spacing of 0.1125 inches or 2.856mm) up to a perforation '16' (spacing of 0.0492 inches or 1.250mm). Our set of dies includes all dies as referred to by the Kiusalas USA and Canada Specialist Gauges. Sizes for our punches start at .023 inches (.711mm) in diameter up to .046 inches (1.168mm) in diameter in .001 inch (.025mm) increments. We manufacture our own papers and water soluble adhesives. Our gum has special additives to obtain various degrees of flexibility, colour and sheen. We also modify our gum Arabic to ensure that it lays flat when applied. Along with the above, we do have other specialty tools so that we are able to provide you with some of the best restoration work available today. This is a topic, which often comes up in conversation with collectors and dealers and it is one that we also have strong feelings about, although it may be easy to guess which side of the discussion we lean towards. Due to a difference in our views, we are no longer members of the APS. The reason being, that the APS insists that repaired, restored or altered stamps are to be identified with indelible ink. We, however, are of the opinion that we spend a great deal of time and effort to restore a stamp's appearances and are not prepared to deface these items with indelible ink unless the customer, (whose property these stamps are), so wishes. It was for this reason that we were 'expelled'. We are of the opinion that there are no repairs or alterations that we or anyone else could make, which would not be detectible with present day technology; in most cases without resorting to the hi-tech light, (crime), spectrometer as was purchased by the APS. Often, rather simple methods can be used to determine whether or not a stamp was restored or altered. Commonplace scanners that are found in virtually every home can go a long way in exposing the repairs. We therefore believe that indelibly marking a stamp is redundant. Besides, when using the proper tools, it is not that difficult to remove an indelible mark should someone want to do so. Seemingly, some people at the top of this organization have to rely on what we believe are slanderous remarks as a means of attacking our service and credibility. I especially resent the implications that our intent, (and that of our customers), is to defraud other collectors. We strongly believe that OUR CUSTOMERS ARE HONEST AND TRUSTWORTHY people. In the 30+ years in this business we have had no reason to believe otherwise. We encourage all philatelists and other collectors, whether or not they are our customers, to do what is legally and morally correct when they deal with restored, repaired or altered stamps and covers. 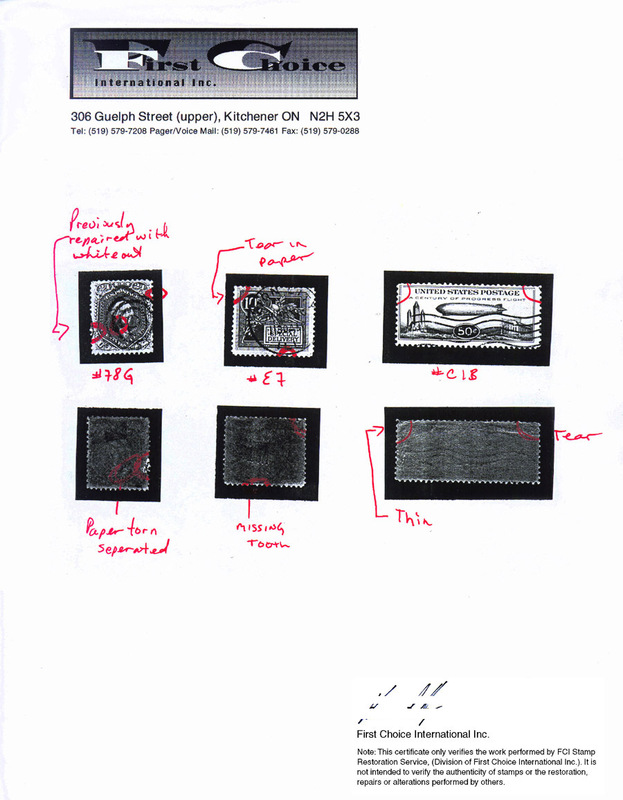 Although our main interest is the restoration of stamps, covers and other paper collectibles and return them to our customers as quickly as possible, we do spend a considerable amount of time making photocopies and scanning images of all items sent to us for repair, before and after the work is done. We do this for both our own and our customers records. We will return your shipment with a black and white photocopy of the items identifying the work done, which is included in the price. If required by the customer we can issue a near photographic quality colour Restoration Certificate at an additional fee of $10.00 US per page. (Depending on image sizes we can fit up to 8 items onto one 8.5" x 11" sheet). Please specify your requirements at the time of the order. It must be understood, that the photo copies or certificates only verify the work performed by FCI Stamp Restoration Service, (Division of First Choice International Inc.). They are not intended to verify the authenticity of stamps or covers, or the restoration, repairs or alterations performed by others. Back in 1997 during the World stamp Expo in San Francisco, I was told at a meeting with the board of the APS that our certificates are 'worthless'. I suppose they have a valid point since it seems that someone in an office hundreds or even thousands of miles away should be better qualified to tell you what we did than us, who did the actual work. If you need an expertizing service, I am certain, that for a fee, the nice people at the APS or other accredited agencies, companies or individuals will be more than happy to assist you. 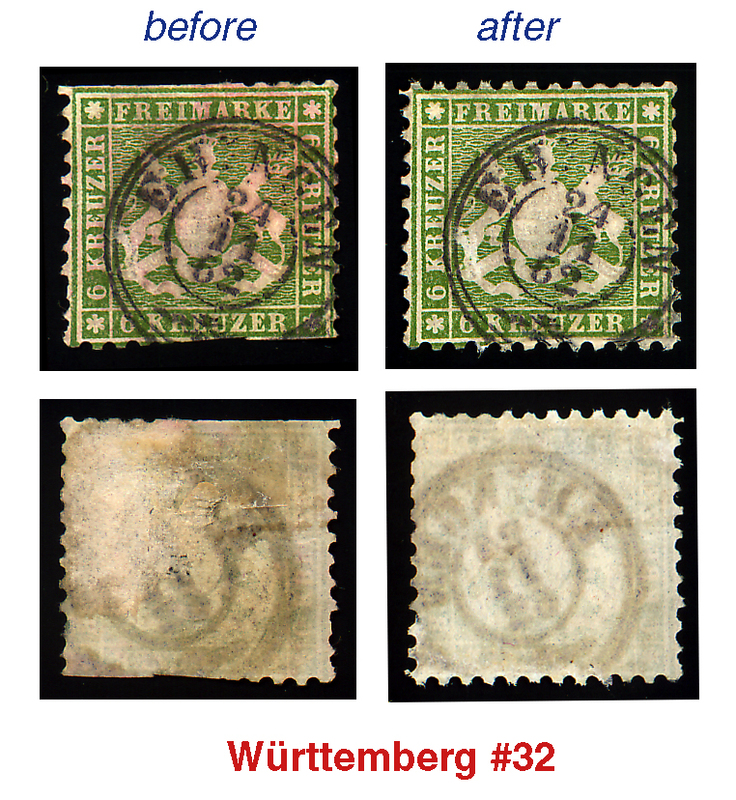 There are a number of good resource books available on the subject of detecting restored, repaired, altered stamps as well as fakes and forgeries. Most of this material is available from the American Philatelic Society and some through your local stamp dealer(s) and now, probably on the internet. This is a very comprehensive subject on which volumes have been written. It takes a lot of effort to address this topic in the depth that it deserves which I believe has already been successfully done by a number of authors. There is also a somewhat recent entry in the information category which tries to explain how to do this work. The soft-cover manual published by Midvale Philatelic Gallery is called 'How to Regum Stamps'. The book addresses a number of valid issues but in my humble opinion many of the suggested methods of repairing and regumming stamps are seriously flawed and may do more harm than good. Perhaps one day I will add my own 2 cents worth on this subject. The following lists provide our customers with information on services available and costs involved. Please feel free to print a copy of any of the following price/services lists. Please note: Services other than those listed may be available upon request - pricing would vary accordingly. IT COSTS NOTHING TO BROWSE! The only difference between the following lists is that the pricing is adjusted to reflect different currencies.